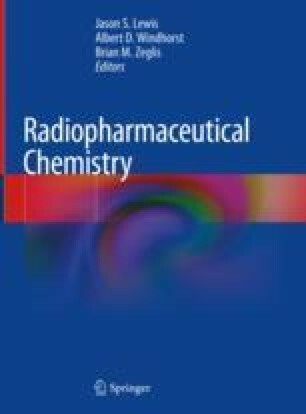 Over the last decade, there has been a significant and rapidly growing interest in the use of radiolabeled receptor-binding peptides for both nuclear imaging and targeted radiotherapy. This is underscored by the recent FDA approval of NETSPOT, a peptide labeled with gallium-68 for the PET imaging of neuroendocrine tumors. As small protein fragments, peptides are attractive radiopharmaceuticals for several reasons, notably their ease of synthesis, tolerance of structural modifications for radiolabeling, high affinity and selectivity for receptors, rapid pharmacokinetics, and lack of immunogenicity. A notable drawback for some peptides, however, lies in their low metabolic stability. This chapter describes the overall process for the development of radiolabeled peptides, including their design, radiosynthesis, optimization, and in vitro and in vivo evaluation. In addition, it highlights some of the most exciting recent and future clinical applications of these radiopharmaceuticals. Wu Z, Li Z-B, Chen X. 18F-labeling of peptides using FBEM. Protoc Exch. 2007; https://doi.org/10.1038/nprot.2007.286.